press room PDF Association - good news! Berlin. The newly elected board of the PDF Association now consists of eleven members. Two marketing experts have been added;Catherine Andersz of PDFTron Systems and Alaine Behler of iText Software. Peter Wyatt, ISO Project Leader for ISO 32000, will also enrich the international association’s leadership team. As the most important regions for the PDF Association, Germany and North America have equal representation with four members each. Matt Kuznicki of Datalogics Inc. remains chairman of the board, and Dietrich von Seggern of callas software GmbH will continue as his deputy. Berlin. With 300 attendees registered for PDF Days Europe 2018, this year’s event was the most popular yet. The agenda included over 30 presentations and panel discussions divided into three parallel tracks. To mark the 25th anniversary of the PDF format, Richard Cohn, Principal Scientist at Adobe and the co-author of PDF 1.0, gave the opening keynote. Berlin. The National Archives and the Library of Congress have announced that they have joined the PDF Association as Partner Organizations of the non-profit organization which promotes adoption of international standards for portable document format technology. Both federal agencies collect, and produce, numerous documents as PDF documents. Berlin. With over 200 attendees, this year’s PDF Days Europe in Berlin was a significant success with the largest attendance of any PDF Days event to-date. The agenda of 35 specialist presentations, user reports and discussions illuminated all aspects of PDF technology. Both the forward-looking presentations on PDF 2.0 and Next-Generation PDF, as well as the practical presentations on current applications of the PDF standard, drew significant interest. Berlin. 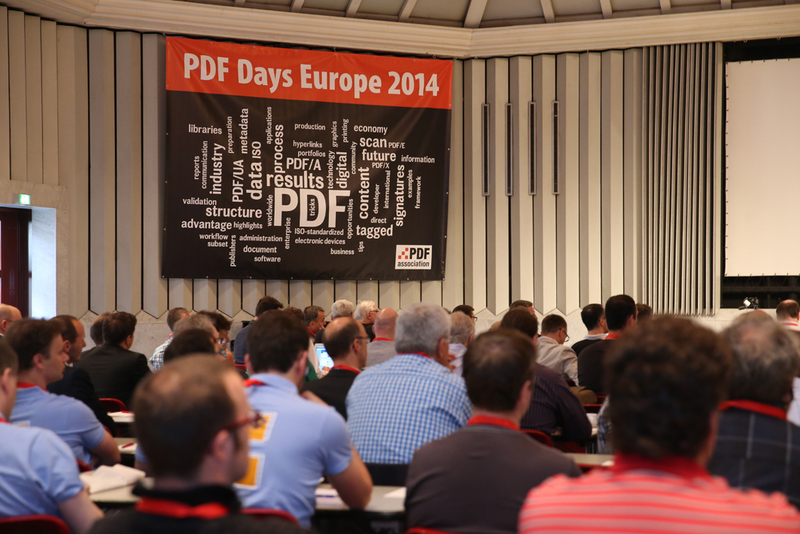 Those interested in the PDF format can now register for this year’s PDF Days Europe in Berlin. A comprehensive agenda awaits, with over 35 contributions on 15 and 16 May covering all aspects of PDF technology. The focus will be on the PDF Association’s largest and most far-reaching project to date, codenamed ‘Camelot2’, which will combine the core functionality of PDF with the flexibility of web-based technology. Berlin. The PDF Association, the non-profit industry trade-group for organizations specializing in PDF technology, today announced two PDF 2.0 interop workshops for 2017. Berlin. After seeing a record number of attendees last year, the 2017 PDF Days will again be held in Berlin. The PDF Association invites interested parties to the Hotel Steglitz International for the two-day event on 15 and 16 May where they will be able to assemble their own personal bundle of knowledge regarding PDF as a global standard. Highlights will include the introduction of a new PDF initiative organised by the association which will make the PDF format more usable on devices of all sizes. Berlin. 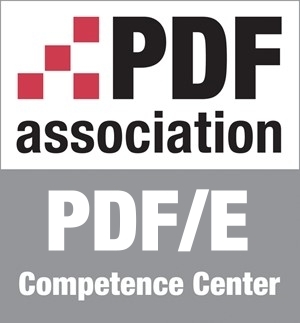 The PDF Association has opened its PDF/E Competence Center to promote awareness of the ISO standard for engineering supporting the secure creation, exchange and use of engineering documents. The fifth of the PDF Association’s Competence Centers, establishes a platform for information and discussion of the benefits of PDF/E in almost every engineering field. It is intended to be a point of contact for experts in 3D technology, architects and construction specialists, as well as developers of PLM applications – in other words, for all engineers who use PDF technology as an integral component of their day-to-day work. Berlin / New Orleans. The Association for Information and Image Management (AIIM) has awarded its Thomas Bagg Standards Award to Duff Johnson, Executive Director of the PDF Association, in recognition of his twelve years of service to the field of standards development. Johnson received the award at AIIM’s recent conference in New Orleans. Berlin. This year, the perennially popular PDF Days Europe will be held on June 14 and 15, 2016. Hosted for the first time in Berlin, the event will be located in the city’s Mitte district. The event will kick off on Monday, June 13 2016 with the PDF Days Pre-Conference. The conference’s PDF University and PDF In Practice slots will be held entirely in English. The keynote, “Utilizing the PDF standard to drive business value”, will be delivered by Scott Mackey, Member of the PDF Association Board. As in previous years, the PDF Days Europe will act as a link between users and developers. Raleigh, NC, Berlin. The TWAIN Working Group (TWG), a not-for-profit organization designed to provide and foster a universal public standard which links applications and image acquisition devices, today announced its partnership with the PDF Association. Berlin / San José. The PDF Technical Conference 2015 will be held in San José on the 19th and 20th of October, 2015. With over 40 presentations and podium discussions, conference attendees will benefit from intensive technical education on a wide range of high-profile subjects, including mobile and cloud applications. Berlin/Cologne. 2015’s PDF Days Europe in Cologne has proved a complete success for another year running. Over 100 participants, around half of whom from user firms, took advantage of the opportunity to learn everything they needed to know about the different PDF standards, as well as the latest news and developments in the world of PDF technology, over the course of just two days. Attendees gave particular praise to the event’s focus on practical applications; with project-related presentations demonstrating concrete application scenarios, and one track dedicated to demonstrating how PDF standards can make day-to-day work easier. The PDF Association used the occasion of PDF/A’s tenth birthday to award the first PDF/A User Award to DAK-Gesundheit, the health insurance provider which adopted a color scanning system using highly-compressed PDF/A files in 2012. Berlin / Cologne. Following a successful premiere in 2014, the second edition of PDF Days Europe is about to start. On the 8th and 9th of June 2015, participants will get to know a range of solutions and technologies related to PDF, the stable global standard that has become an indispensable part of the business world. The Maternushaus in Cologne will offer information and inspiration for IT managers, decision-makers, ECM strategists, developers and PDF experts looking to use PDF optimally. The inaugural PDF/A User Award also underscores just how user-focused this event intends to be. It will be awarded for the first time this year to mark the tenth anniversary of the PDF/A standard. New York / Washington DC. From digital signatures to automated invoice processing to ADA compliance, PDF’s capabilities go far beyond a faithful rendition of a printable page. But although PDF is accepted everywhere, the technology is underutilized everywhere as well. Berlin. PDF Association has significantly expanded its board of directors. The now ten-member-strong committee is composed of representatives from leading forces within the PDF industry, five from Europe and five from North America, increasing the PDF Association’s clout as an international specialist association for PDF standards. Olaf Drümmer and Duff Johnson have been confirmed as the chairman and vice-chairman of the board respectively. Berlin/Cologne. The PDF Association has successfully brought to life a new user-focused event in the form of the “PDF Days Europe 2014”. In mid-June, 160 participants came to Cologne to seize the opportunity to learn everything there is to know about the different PDF standards, their advantages and their uses. The first day focused on sharing knowledge, allowing visitors to assemble their own personal information package out of three parallel series of developer-neutral presentations. The second day, the “practical day”, was all about the practical and successful implementation of PDF projects using specific solutions. Participants especially praised the practically-minded selection of subjects, the structure of the conference with its three parallel series of presentations, and the many opportunities to speak to suppliers and other users. With this overwhelmingly positive feedback in mind, the PDF Association plans to continue the “PDF Days Europe” next year. Berlin / Hannover. This year at CeBIT, PDF Association members are focusing on practical uses for PDF/A-3. This version of the ISO standard opens up many new potential applications, as it allows any format file to be embedded into a PDF/A document. One prominent example of this is the ZUGFeRD data model, which specifies PDF/A-3 as the carrier format for exchanging digital invoices. Accordingly, Association members will show how businesses can create and work with ZUGFeRD-compliant invoices. Email archiving is another practical use for PDF/A-3, as this third version of the standard can combine both archivable emails and attachments with their original source files to create a single PDF/A document. PDF Association members will also show the first examples of this principle in practice. Berlin. The Swiss non-profit foundation "Access for all" has published the PDF Accessibility Checker (PAC 2) the world's first tool for verifying PDF documents conform with PDF/UA and are accessible to people with disabilities. The PDF Association contributed significantly to the development of PAC 2 in several ways. With these and other initiatives, the PDF Association underlines its commitment to universal accessibility in PDF, the world’s preferred format for electronic documents. Even before the PDF/UA standard was published in July 2012, the PDF Association supported electronic document applications developers with numerous educational and technical resources regarding the ISO standard for accessible PDF documents, and thereby supported developers in the implementation of requirements of PDF/UA. The organization created a series of seminars in countries across the globe, and in 2013, devoted entire tracks in each of its two Technical Conferences to PDF/UA. The PDF Association recently published the free brochure “PDF/UA in a Nutshell", and with the Matterhorn Protocol, established a PDF/UA-based test catalog for accessible PDF documents and forms. Berlin/Stuttgart. The PDF format turns 20 this year. In that time, it has become the world’s most popular file format and – since 2008 – an ISO standard. As PDF’s market penetration has increased, further specifications have been developed and ratified as ISO standards. At the DMS EXPO, from the 24th to the 26th of September 2013 in Stuttgart, PDF Association members will explain how these PDF standards work, covering PDF itself, PDF/A for long-term archiving and e-invoicing, PDF/UA for barrier-free PDF documents, PDF/VT for variable and transactional printing and PDF/X for sending printing masters. The primary focus at the DMS EXPO will be the issue of e-invoicing using PDF/A-3 and the ZUGFeRD data model. The day before the show, the PDF Association will hold a half-day seminar discussing the PDF/A standard and e-invoicing with PDF/A-3. Berlin. The PDF Association is pleased to announce the publication of Matterhorn Protocol 1.0 to promote conformance with PDF/UA (ISO 14289), the international standard for accessible PDF files, readers and assistive technology. The Matterhorn Protocol is designed to foster adoption of PDF/UA by providing a set of 31 Checkpoints and 136 Failure Conditions that help software developers exchange detailed information on PDF/UA conformance and create software to make it easier for document authors to create fully accessible PDF files and forms.